Learning to brush a cat's teeth is necessary for their health and hygiene, yet cat owners rarely carry out this important task of regular dental care. Many feline owners simply don't know it is needed while others are too intimidated to try for themselves. 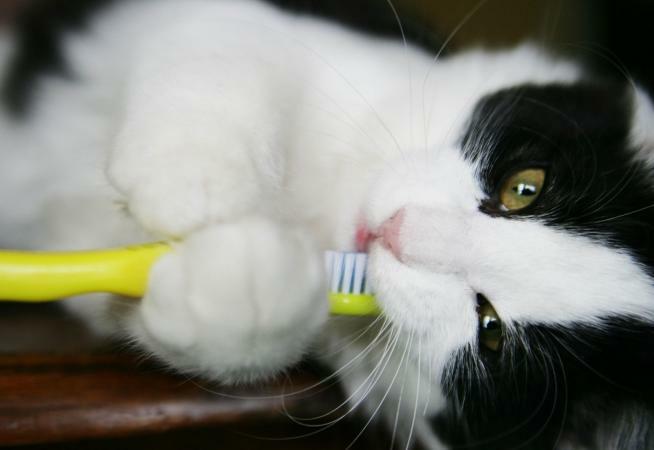 Brushing a cat's teeth is easier than you might think! Brushing your cat's teeth is a critical part of their regular care. More than 80 percent of cats aged three or older get some form of dental disease. However, owners appear unaware of the need or just won't do it. A survey in Canada found that only 27 percent of cat owners brush their cat's teeth at all and the numbers likely aren't much different in the U.S. Dental problems can cause serious health care issues for cats. A cat suffering from dental disease may find eating painful and lose weight and become sick as a result. One of the most common illnesses that veterinarians see in cats is periodontal disease. In addition to bad breath, it can lead to permanent teeth damage, as well as damage to a cat's internal organs including the heart, kidneys and liver. Another reason to brush your cat's teeth regularly is you can recognize problems early. In addition to bleeding gums and other signs of periodontal disease, you'll be able to notice if your cat's breath smells bad and if any teeth appear infected, sensitive or cracked. You may also see sores and lesions in their mouths, an early sign of cancer. The sooner you realize there's a problem, the better the prognosis for treating the cat. If you bring your cat home as a kitten, start acclimating them to getting their teeth brushed right away. This is the best way to end up with an adult cat that may not enjoy teeth brushing but will tolerate it. If you have an older cat who has never had their teeth brushed, it may take a bit more work, especially if your cat is shy or becomes aggressive when handled. The first step in cleaning a cat's teeth is to have all your supplies laid out in front of you. This makes it easy to grab something if you need it. The more stressed your cat is, the more quickly you may have to move. You don't want to be furiously searching for an item you need. Collect the following items. A toothbrush made for a cat: A toothbrush for humans will be too big. Toothpaste made for cats: Human toothpaste is not appropriate for cats and fluoride can be toxic. Some canned cat food that smells particularly good: You can use some tuna fish in water or low sodium chicken broth as well if you need extra inducement the first few times. A bag of extra-delicious moist cat treats: These can be used to reward your cat and associate teeth brushing with positive things. A cat brush and some cat toys: These can serve as effective tools for positive association before and after a brushing session. A comfortable place for your cat to rest: This should be elevated so you'll have easy access. A kitchen or bathroom counter is a good option, or even a sink if the cat is comfortable sitting there. You can lay out a towel or cat bed for comfort. A tall, sturdy cat tree could work too, since this is a spot your cat normally enjoys. Some people have the cat sit on their lap. If you have any concerns at all about your cat getting upset and bolting, you can get scratched. It's a good idea to place a heavy blanket on your lap and over your chest and wear a long sleeve shirt if you take this route. Talk to your veterinarian or veterinary technician about toothpastes they recommend. Many veterinary clinics carry appropriate toothbrushes and toothpastes for cats too. If you're feeling nervous, ask your veterinarian if a technician can show you the steps. Most will be more than happy to walk you through a demonstration. Because cats can be quite sensitive to change, the best way to start this process is in baby steps. Don't plan on brushing your cat's teeth on the first session. Help your cat feel calm. Start the session doing something she likes. This could be a brushing session or some play time with a toy. You could try plugging in a pheromone diffuser or give Pet Remedy as a calming measure. These products aren't necessarily proven to work, but some owners swear by them. Put a tiny bit of the toothpaste on your finger. Let your cat sniff and taste it. Rub a tiny bit of canned cat food on the toothbrush. Let your cat sniff it and lick the brush. You can also use the canned tuna in water or chicken broth. End the session by giving your cat some treats, followed by brushing or play time. Repeat these sessions for five to 10 minutes a few times during the first week. If your cat seems relaxed, proceed with the steps below. Otherwise, continue with the process above until she is more accepting of the procedure. Gently lift your cat's top lip with your finger to see their gums. Do this for a second and then reward your cat with a treat while talking gently. Repeat and start gently rubbing your finger over the cat's teeth for a few seconds. You may also want to dip your finger in the tuna fish water or chicken broth when rubbing the cat's teeth for an extra pleasant sensation. Repeat with the bottom lip. Perform these steps a few times over the course of a few days for short sessions of no more than five minutes. Once your cat is comfortable with you handling its lips and teeth, move to the next phase. Put a small dab of toothpaste on the brush, gently move the cat's upper lip with your fingers, and rub the brush slowly and softly on the cat's teeth. Don't worry about doing a thorough cleaning at the beginning. Your goal is to get the cat comfortable with the brush moving against their teeth. Repeat this step with their lower lip and teeth for a few short sessions. Remember only to brush the outer area of their teeth as most cats will not accept you moving the brush into their mouths to clean the back at this point. As you move through the steps, slowly add a bit more pressure to the brush and work your way toward brushing the back molars. You don't need to press down hard to clean their teeth. Also, always take a step back if your cat becomes stressed out, and always end your sessions on a positive note with play time, brushing or treats. If you feel too uncomfortable trying to brush your cat's teeth or have physical limitations, most veterinary clinics offer dental care services. During this procedure, the cat will be sedated so the staff can get in their mouths and do a deep cleaning without causing undue stress. They can also take X-rays to see if there are any concerns that aren't clearly visible, like cavities. Even if you regularly clean your cat's teeth at home, you still should visit your veterinarian annually for a thorough professional cleaning. Brushing a cat's teeth may seem difficult at first, but if you move in baby steps and work at your cat's level of comfort, you can convince them to accept this important part of their health care routine. Always remember that periodontal disease is a serious concern for cats and if you feel uncomfortable at all brushing their teeth, your veterinarian can assist you.